Be among the first to try this brand new recipe created by the talented Laura Baktiarian especially for our friends at Robern Menz – the home of the iconic FruChoc. Laura also took this amazing photo (find her @piecesofme). Yum! To make the pastry, roll the pastry out between 2 sheets of non-stick baking paper to 3mm-thick. Preheat oven to 160°C. Line a lightly greased loose-bottomed, fluted tart tin with the pastry. Trim the edges and prick the base with a fork. Refrigerate for 30 minutes. Line the pastry case with non-stick baking paper and fill with baking weights or rice. Bake for 15 minutes, remove the paper and weights (or rice) and bake for a further 10 minutes or until the pastry is light golden. Remove from the oven and set aside. To make chocolate ganache, combine chocolate and cream in a heatproof bowl over a saucepan of simmering water. Stir with a metal spoon until smooth. Remove bowl from heat. Set aside to cool slightly, stirring occasionally, until ganache is thick and spreadable. Roughly chop 50g of the Menz Strawberry Flavoured FruChocs and set aside in a small bowl. To assemble the tart, pour jam into cooled tart case, spread evenly. Follow by scattering the chopped Menz Strawberry Flavoured FruChocs over the jam. Pour chocolate ganache on top of the jam and add a more chopped FruChocs. Set in fridge to cool completely. 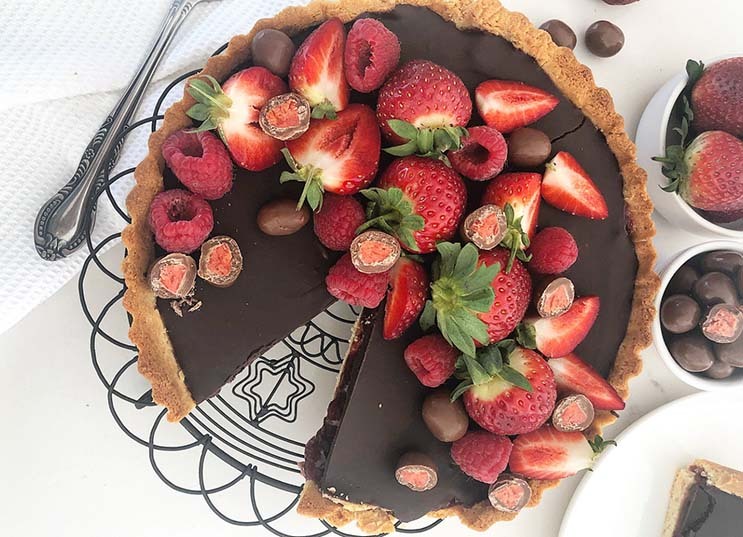 When tart is set, decorate using fresh strawberries and Menz Strawberry Flavoured FruChocs.